"Stargate Origins," a 10-episode prequel series to the Stargate science fiction franchise, will debut on MGM's Stargate Command digital streaming service launching in Fall 2017. Fans of "Stargate," rejoice! The science fiction franchise is getting a revival with "Stargate Origins," a new digital series that will serve as a prequel to the existing Stargate universe, which celebrates the 20th anniversary of its TV debut this year. MGM announced the new Stargate TV series at San Diego Comic-Con, debuting a teaser trailer on Friday (July 21) for new show. The series will follow the character of Catherine Langdon during the early years of the titular Stargate's discovery in 1928. It will be a 10-episode series available on Stargate Command, a digital streaming site MGM will be launching this fall. So Stargate fans will likely have to sign up for the streaming service to see the new show, much like how CBS's digital streaming service CBS All Access will host the upcoming "Star Trek: Discovery" series. Get full San Diego Comic-Con 2017 coverage from Newsarama, Space.com's sister site, this weekend. 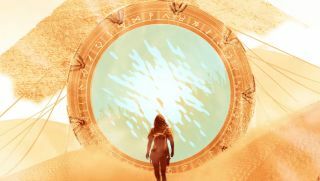 "'Stargate Origins' will explore a brand new chapter in Catherine Langford’s early history surrounding the extraordinary portal," MGM representatives said in July 20 statement. "Young Catherine embarks on an unexpected adventure to unlock the mystery of what lies beyond the Stargate in order to save Earth from unimaginable darkness." "We've been eager to revisit the Stargate franchise, and create an all-new story that honors the founding mythos and gives loyal fans more mystery and adventure," said Kevin Conroy, President of Digital & New Platforms at MGM in the statement. "We view 'Stargate Origins' as a thank you to fans who have been keeping the spirit of the franchise alive for nearly 25 years. With the increasing popularity of digitally native content that can be streamed to any device, MGM is committed to the production of premium linear mid-form content and are proud to launch with 'Stargate Origins.'"